23 February 2017, at 12:00a.m. EU, SPAIN - In the Spanish market, 2017 seems to have started positively. We are now at prices above 2015 and 2016, and almost at the levels of 2014. 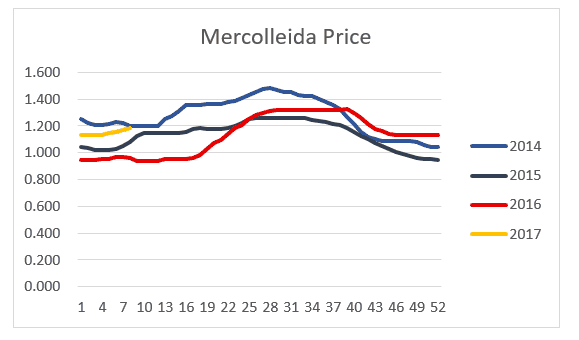 The Mercolleida market price for last week closed at 1.182 € / kg live. In 2014, we were at 1.20 € / kg live, writes Mercedes Vega, General Director for Spain, Italy & Portugal. After being below the German value of live animals for four and a half months, the Spanish price has managed to catch up to the German level. Despite the great uncertainties that exist, this price is giving Spanish producers and the whole industry a positive outlook and attitude. The permanent mystery is China, and how it will impact the new situation in Germany with tons not being able to export to China, which represents 27 per cent of the total slaughtered in that country. Spanish producers are selling all their production without problems at good prices, and the slaughterhouses are buying these animals and selling the meat fresh, as it happens in the rest of the EU. The stock of frozen meat through Europe remains low. The export to Asia is pulling all excess supply without problems. What we are seeing in the Spanish market is a change of trends. Every day, you can hear more projects looking for a 50 per cent Duroc product, or a 100 per cent Duroc animal. This is due to two circumstances. On the one hand the domestic market is gradually changing towards a higher quality market. According to Nielsen's "Premium Consumer" report, three out of ten Spaniards (30 per cent ) would make an economic effort for seafood or higher quality or differentiated meat, while a similar percentage, 27 per cent , would buy a good mobile phone , Tablet or computer. This shows where the domestic market is going. On the other hand, Spain’s exports has exceeded in volume its domestic consumption. In other words, in 2016, more tons were exported than those consumed. According to the AEAT (Tax Agency), tons of pork exported last year was 2,167,253 (which means 18.0 per cent more than in 2015). Of which, 1,319,196 tons (5.4 per cent more than in 2015) was to the EU and 847.971 tons (44.9 per cent more than in 2015) to other countries. China became the most popular destination of Spanish exports (251,835 tons, which represents 16.9 per cent of the total), surpassing those made to France (233,087 tons) which until now was the first destination (representing 15.6 per cent of the total and has decreased in relation to 2015 by 14 per cent). This implies that the market to third countries has been increasing. These markets, by our experience, demand pork of more quality, like Japan and Korea and even China, which absorbs everything. Also worth noting is that there is a new export destination. The government of India has officially communicated to the Spanish government the approval of certificates for the export of meat and pork products to India from Spain. 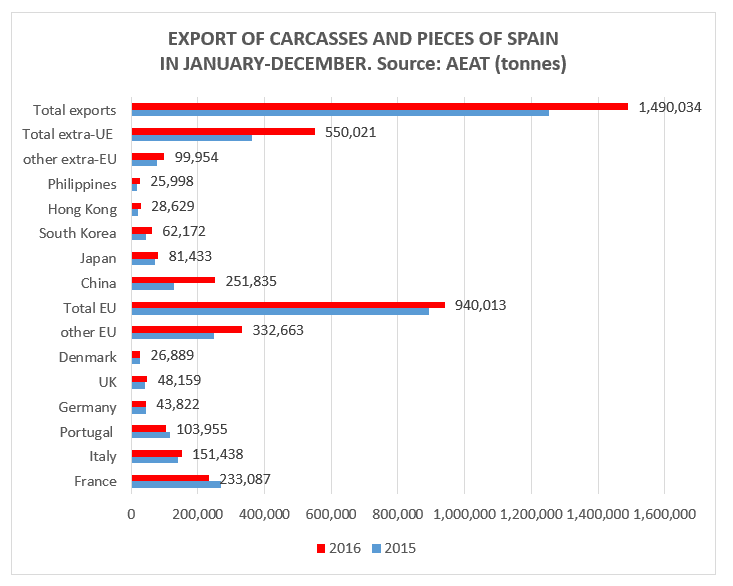 Spain remains the world's third largest pork producer and the first in Europe, with a census of bristles 2,414,980 at December 31 and with a projection of animals slaughtered 47,862,302 at the same date. There are good expectations for this year, let’s see what happens.